Leonard and Marie McGinnity are part of a long legacy of family giving to Dakota Boys and Girls Ranch that began with Leonard's parents. Leonard first learned of the Ranch when he was in high school. His parents were of the generation where they didn't talk much about those things, but Leonard did know Dakota Boys Ranch (what it was called at that time) was important to his parents and that they made regular donations. When Leonard's father died 25 years ago, his mother continued to support the Ranch until her death in April, 2015. Over the years, Leonard and his wife, Marie, supported the Ranch as they were able. They felt it was important to continue his parent's legacy of support. While they were sending in regular donations, they were raising their family, running a business, and making a difference in the people who came into their lives. Through the pharmacy they owned in Aurora, CO, Leonard and Marie ministered to the young kids who worked there, and to the elderly and disabled patients for whom they delivered medications. "After about 15 years of owning the pharmacy, I realized ministering to the kids who worked for me was my calling." Leonard said. "After they got comfortable with us, they told us their life stories, and we learned that about half of them didn't live with their parents-they lived with grandparents or in a foster home. We felt the Lord sent them in our direction. I hope I made a difference." Marie spent much of her time delivering medications to their elderly and disabled customers. But "delivery" meant more than dropping the medications off at the door and rushing off to the next stop. She stopped to visit and while she was there she changed lightbulbs, helped them clean, and did whatever else they needed done. "They were lonely and wanted someone to talk to…they asked me to do chores to keep me there longer, and I was happy to help," Marie said. 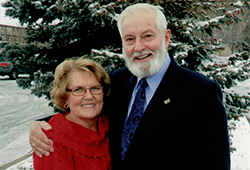 Leonard and Marie recently became more involved with the Ranch, and visited the Minot and Fargo campuses. The visits solidified their belief in the Ranch. Leonard said, "When we did our tour, we learned that many of these kids didn't have anyone to guide them or give them any help for the future. When I think of Dakota Boys and Girls Ranch, I think safety net, hope, and a chance for a future for these kids. [The Ranch] give kids an opportunity to survive the bad choices they, or more likely their parents, made along the way. These kids are in the position to break the chain of bad decisions. That is good for the whole community. And the beauty of it all, is the spiritual focus." The McGinnity's recently made two significant gifts, one to general operating and another to the Hope in the Heartland campaign. They also initiated discussions with Rich Berg, senior development officer at the Ranch, about North Dakota Tax Credits and contributing to an endowment fund. Through their recent and ongoing gifts to the Ranch, Leonard and Marie are committed to continuing the family legacy of giving by teaching their children and grandchildren about philanthropy. They want to show their family how giving not only benefits the charity but the donor. Three of their four children live near them in Colorado, so every Sunday they go out to lunch. Those weekly meals give Leonard and Marie and chance to share the things that are important to them with their family…things like their Christian faith and the importance of philanthropy. "There is so much power in giving back," Leonard said. "People don't realize that until they've experienced it. When you give, you give with hope that you will make a difference. I tell my kids that you have to be brave and take a risk because what you provide to God, he will return ten-fold. They're not convinced yet, but they are starting to see it."